Mr. Bai Yansong, an anchorman for China Central Television (CCTV), and producer Liu Aimin, came to visit Dharma Master Cheng Yen to learn more about Tzu Chi. They were both impressed after hearing that many middle school and college students were spending their summer vacations volunteering at Tzu Chi General Hospitals. "Children nowadays are well protected by the love and care of their parents. They have not experienced the ups and downs of life and do not grasp the concept of human suffering. When they volunteer at the hospital, they are exposed to a variety of patients and cases. From them, they learn that, young, old, rich or poor, all are susceptible to the four natural sufferings of life – birth, aging, illness and death. ” Master Cheng Yen then cited an example of how many young patients at the hospital were the same age as the volunteers or had gotten seriously injured as a result of reckless driving. These stories opened the eyes of the student volunteers, and seeing the patients’ parents give their unfailing love and care to their children made the volunteers feel more grateful towards their own parents. On the other hand, students also witnessed suffering in the elderly patients who had no family to look after them. The situation awakened their compassion and sense of moral duty, and as they patiently listened to the elders’ life stories, they reflected on their own lives and their own attitudes towards their parents. Master Cheng Yen believes that in volunteering at the hospital and personally witnessing such sufferings, these youth can begin to fathom the true meaning of life. Mr. Bai then asked Master Cheng Yen the reason why she often says that she is emotionally moved every single day. 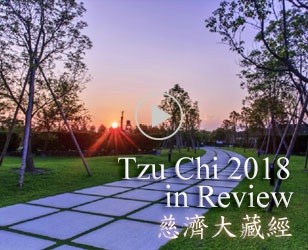 “That is because there are many touching stories happening in the world of Tzu Chi every day.” Master Cheng Yen shared a story from medical care professional, Huang Weizhen, who works at the ICU in the Xindian Tzu Chi General Hospital. Huang Weizhen noted that one patient had no family members and was often visited and looked after by Tzu Chi hospital volunteers. After numerous, continuous visits, the patient then expressed her intention to donate her body to the hospital for medical teaching after she passes away. "Actually different religions use different expressions in their interpretation of love, but what is ultimately emphasized is always the purest form of love. Christians and Catholics often speak of “brotherly love”, and in Buddhism, the term used is “compassion”. This compassion encompasses the widest range of love, or "Great Love”. In compassion, we speak of kindness and empathy. Kindness refers to bringing happiness to others, regardless of any personal connection, and we often say "great mercy even to strangers.” Empathy refers to putting oneself in another’s situation, and we often say “understanding of and for all”. “Brothers can be formed after birth but connection does not require flesh and blood.” Even if there is no blood relation, in selfless love, one treats everyone as their own kin, loving and caring for all as their brothers. Master Cheng Yen once recounted a heart-warming story at one of the volunteer morning gatherings. The family of Coach Lin could not afford to support his education when he was a child. However, his school teacher stepped in and offered financial support, allowing him to complete college. He even represented Taiwan at the Olympics, ranking 7th in the world, and then went on to spend many years abroad serving as a military counsel. Later, inspired by his teacher, Coach Lin decided to return to his home town and vowed to offer whatever help he could to students interested in track and field. A coincidence led to his meeting with a student, Shenghao. Shenghao had an abusive alcoholic father, and his mother had left the family as a result of the abuse. With no maternal love or paternal guidance, Shenghao often skipped school, got into fights, and other trouble. Despite Shenghao’s misbehavior, Coach Lin still saw great potential in him. He obtained consent from Shenghao’s family and adopted Shenghao. Coach Lin soon began training him in track and field. Shenghao did not disappoint the coach either; he focused hard on his practices and kept himself out of trouble. One day, while on a trip to Taipei for a competition, they saw a child at the train station eating a spoilt lunch box with relish. Shenghao knew the child and told Coach Lin about his story. Mengqiu’s parents gave him up for adoption as soon as he was born, but his stepparents did not take the responsibility seriously. They paid little to no attention to him and were liberal with scolding and spanking. Mengqiu once played with a lighter and accidentally burned an entire row of scooters on the street. He thought it was fun and didn’t even realize the huge trouble he caused.Mengqiu preferred roaming around homeless, sleeping at cemeteries and train stations, enduring the outdoors; anything but returning home. He came to Taipei from Yuli, subsisting on thrown-away food and garbage. Coach Lin decided to adopt Mengqiu as well and after obtaining consent from Menqiu’s family, and began to teach him track and field. Coach Lin believes that children were born innocent and that with the proper love, education and guidance, they can grow to have unlimited potential. He not only teaches his two adopted kids track skills, but also draws up daily routines for the children to help correct their bad habits from the past. Now, Shenghao and Mengqiu help with chores, cook dinner, enjoy school and even review homework on their own. This family of three cares for and relies on each other, and the effort shows. The house is filled with trophies and plates from numerous track and field competitions. Shenghao has won two consecutive championships at international youth marathons. Coach Lin makes a living with temporary jobs that can only support basic living expenses for the family. However, with the two adopted students in their teenage years, the increasing expenses were becoming a challenge for the family. They began receiving support and care from Tzu Chi volunteers who had heard their story from Mengqiu’s teacher. The two students show their gratitude by volunteering at the recycling station on weekends and at the Yuli Tzu Chi General Hospital during their summer and winter breaks. Both of them also participated in the “Send Great Love to South Asia” tsunami fund raising initiative after they saw hospital staffs take to the streets with donation boxes. Shenghao wants to become a professional athlete in the future while Mengqiu, who once got in trouble for playing with fire, is determined to become a firefighter. Master Cheng Yen believes this story demonstrates the cycle of love. Although not connected by family or blood, out of “great kindness” the teacher of Coach Lin hoped his student could stay on a positive course in life and become successful in the future. Thus he was willing to give his selfless love. Coach Lin’s teacher helped him continue his education and after achieving his success, he returned the favor by passing on his own selfless love to his two adopted children. 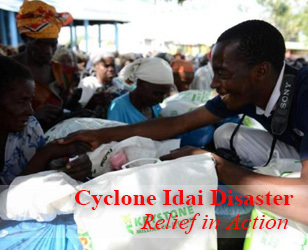 Likewise, Tzu Chi volunteers also offer their help without expecting anything in return. Their only wish is to encourage these children so that one day, the children too can positively contribute back to society. "At any particular place, seize the moment and fulfill one’s moral charitable duty. In this way, space, time and people converge as one: ‘Three as One’.” Master Cheng Yen elaborated that because she cherished every moment of every day, she does not spend time elaborating on the distant future. Cherish each second and do the right thing, and it will not enter one’s mind to think about future returns from the people being helped. 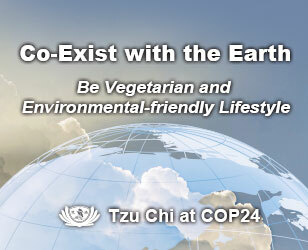 "Tzu Chi members are always thankful. We base our charity on respect and love. The people who suffer enlighten us with their suffering. We learn to appreciate that being able to help others means we are very fortunate. That's why we need to be grateful.” Master Cheng Yen said that only when one appreciates his or her own fortune will one be content and not be greedy. In that convergence of space, time and people, to behave with gratitude, respect and love is to cultivate oneself. Master Cheng Yen brought up the Tzu Chi volunteers in Johannesburg, South Africa, as an example. For six consecutive years they had visited a shelter for the blind. Every month they brought daily necessities there to distribute. When the Tzu Chi volunteers were collecting donations for the 2004 Southeast Asia tsunami survivors, the blind took out the little money they saved and donated it without a second thought. They also sang hymns to mourn those that perished in the tsunami. From Indonesia to Sri Lanka, the small donation was their love spread across Southeast Asia. This exemplifies “wealth amid poverty”. Even though their lives are impoverished, their spirits are enlightened, so they are in fact wealthy! "How can unconditional love, trust, and forgiveness be achieved? Is it very difficult?” asked Mr. Bai. How to not be bothered by the small things? Why doesn’t one become popular despite doing good deeds?
" Be grateful to your parents and to all sentient beings, every day. In everything you do, never disappoint them. "